BRUSSELS: The leaders of the 27 other European Union members states on Sunday approved the terms of an historic Brexit deal with Britain, at a special summit in Brussels. "EU27 has endorsed the Withdrawal Agreement and Political Declaration on the future EU-UK relations," EU Council President Donald Tusk announced on Twitter. 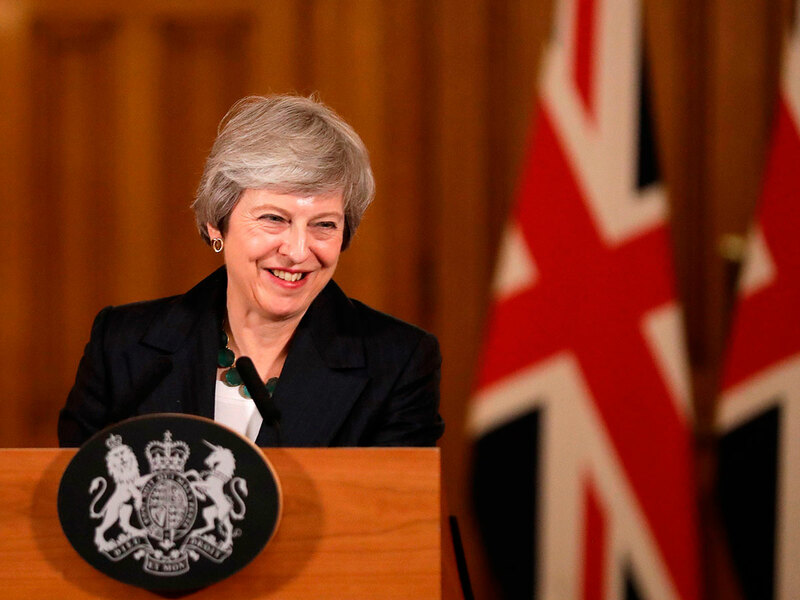 British Prime Minister Theresa May declared Sunday that a Brexit deal struck with the European Union is the only one possible, urging MPs and the British public to get behind it. "If people think there is somehow another negotiation to be done, that is not the case," she told reporters after EU leaders approved the divorce text. European Union leaders formally agreed a Brexit deal at a Brussels summit on Sunday, urging Britons to back Prime Minister Theresa May's package, which faces furious opposition in the British parliament. The 27 leaders took barely half an hour to rubber-stamp a 600-page treaty setting terms for Britain's withdrawal from the European Union on March 29 and a 26-page declaration outlining a future free trading relationship. "This is the deal," European Union chief executive Jean-Claude Juncker told reporters on his way in to the meeting, saying he believed May would get it through parliament and ruling out big new concessions. "Now it is time for everybody to take responsibility -- everybody," said Michel Barnier, the Frenchman who has ground out the withdrawal treaty over the past 18 months. Juncker called it "a sad day", saying Brexit was a "tragedy" and tough on both sides. "I believe that the British government will succeed in securing the backing of the British parliament," Juncker said, declining to comment on what might happen if May fails. "I would vote in favour of this deal because this is the best deal possible for Britain," he added. In a sign of worries ahead, Lithuanian President Dalia Grybauskaite tweeted after the deal was endorsed in the summit chamber that the exit process was "far from over". Barnier called the package a basis for close future ties, insisting: "We will remain allies, partners and friends." French President Emmanuel Macron said the Brexit vote showed Europe needed reform. He stressed that Paris would hold Britain to tight EU regulations, notably on the environment, in return for giving it easy trade access. Saying the EU "hates" Brexit, Rutte said: "Nobody's winning -- we are all losing." But, he said, the deal was an acceptable compromise for all that gave May a chance to clinch a solution. The biggest question now facing the EU is whether May's divided minority government can steer the deal, which foresees London following many EU rules to keep easy trade access, through fierce resistance in parliament in the coming weeks from both supporters and opponents of Brexit. Lithuanian President Grybauskaite said there were at least four possible outcomes if parliament blocks the package. She named three - that Britons would hold a second referendum, hold a new election to replace May or return to Brussels to try and renegotiate the package. A fourth is that Britain will simply crash out of the bloc on March 29 without legal clarity. Summit chair Donald Tusk said "no one will have reasons to be happy" when Brexit is concluded but quoted British rock star Freddie Mercury of Queen, who died 27 years ago on Saturday, to say: "Friends will be friends right till the end." The 27 EU national leaders will gather for an hour or so to formally endorse the package, which foresees little changing during a transition period lasting another two to four years. They will then meet May briefly as she seeks momentum to get the package through the British parliament in the coming weeks. The Democratic Unionist Party, whose votes from Northern Ireland have helped May to govern since she lost her majority in a snap election last year, said it would try to block a Brexit deal it called "pitiful" - partly because it binds London to many EU rules it will no longer help set and partly as the DUP fears it could weaken the province's ties to Britain. In an open letter to the nation May said she would campaign "heart and soul" to get her Brexit deal through. "It will be a deal that is in our national interest one that works for our whole country and all of our people, whether you voted Leave or Remain," she said. Wrangling over how to keep open troubled Northern Ireland's land border with the EU without creating barriers with the Irish Republic dogged much of the Brexit talks. Another relic of the imperial past, Britain's 300-year-old naval base on Spain's southern coast, threatened to derail plans at the last minute. Spanish Prime Minister Pedro Sanchez threatened to boycott Sunday's meeting if he did not get amendments to the deal to ensure Madrid gets a say in Gibraltar's future ties with the EU.